The mobile phone rings and the caller’s name flashes on the screen. Jay, it says. Its owner, a top Hyderabad-based industrialist, does not take the call. Tense, he reaches for a glass of water. The phone rings again. This time there is no escaping Jay, industrialist, Telugu Desam MP and close aide of AP Chief Minister N. Chandrababu Naidu. A brief chat later, the Hyderabad-based industrialist goes into a huddle with his trusted aides. Jay, one of the best CEOs in the country, has been on a dialling spree of late, seeking the support of industrialists for Chandrababu Naidu. These industrialists have been giving the cold shoulder to Jay, otherwise a close pal. Nobody wants to fall on the wrong side of Telangana Chief Minister K. Chandrasekhar Rao or his son and TRS working president K.T. Rama Rao. Sources privy to this development said that Jay had called at least six top industrialists in Hyderabad and they are all worried. “They want to remain on good terms with Naidu, but they don’t want to antagonise the first family of Telangana as they have their projects running in the state. This is why they have decided to ignore his requests, albeit politely,” said a source. The Telugu states are home to several top listed companies including the likes of pharma majors Dr Reddy’s Laboratories and Aurobindo Pharma as well as the software firm Cyient. Sources said Jay has been telling industrialists that many NRIs have been playing a key role in the development of AP and the same was expected of them. It is learnt that soon after the first few industrialists received his phone call, word spread and consequently many are trying to avoid him. “He is a good friend but we cannot come to his rescue this time. It’s a huge dilemma,” said an industrialist. 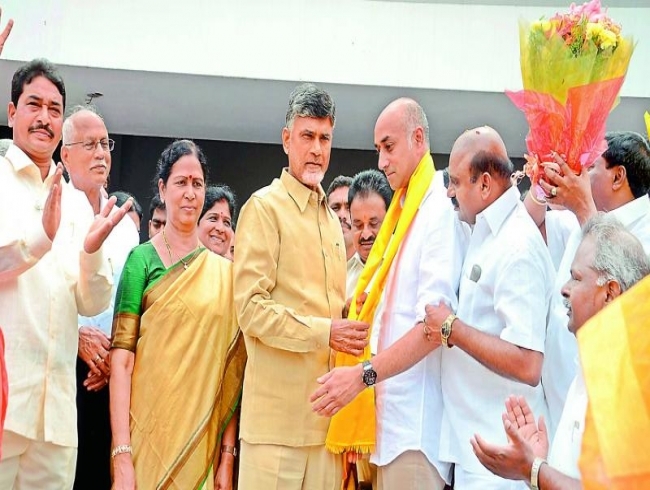 “The real problem is that all these guys are good friends not only with KTR, who has facilitated many of their contracts, but also with Naidu, and that is the dilemma. They have decided to let go this one and hold on to the Kalvakuntla family for obvious reasons,” a source said. “While some industrialists declined Jay’s request very politely, many said they would think about it, which pretty much means no,” sources said. There is another worry: Their fate in Andhra Pradesh in case the TD comes back to power. Among the top industrialists Jay has approached so far is Anil Kumar Chalamasetty of Hyderabad-based Greenko, India’s largest renewable energy firm. The company is working to complete three projects in Andhra Pradesh, Karnataka and Maharashtra by 2021. Greenko has built the world’s largest solar park in Kurnool. Jay also approached Megha Engineering & Infrastructure that entered the Limca Book of Records for being the the fastest completion of a river-linking project at Pattiseema in Andhra Pradesh. It is alleged that Chandrasekhar Rao had allotted about Rs 60,000 crore worth of work to the firm in Telangana. In case you still didn’t get the hint, Happy April Fool’s Day!